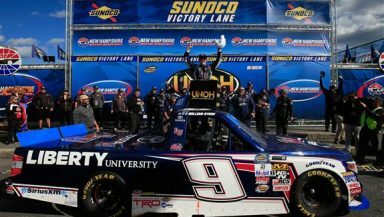 LOUDON, N.H — Dominating doesn’t begin to describe the performance of William Byron at the UNOH 175 at the New Hampshire Motor Speedway. The 18-year-old rookie from Charlotte led 161 of the 175 laps on the way to his sixth Camping World Truck Series win of the season. With the victory in the first race of the Truck Series Chase, Byron advances to the second round. The only laps that Byron didn’t lead came after a caution for John Hunter Nemechek’s spin on lap 52. A different pit strategy put Byron, who took four tires, in sixth place for the restart behind the leader Cody Coughlin who stayed on the track to inherit the lead. Coughlin held the lead for three laps before Kyle Busch Motorsports teammate Christopher Bell overtook him for the top spot. Eleven laps later, Byron recaptured the lead and held it throughout the rest of the race. Bell mounted a charge as Byron was negotiating lap traffic and cut the lead to a half second when they received the white flag, but Byron held on for the victory. Byron, Bell and Coughlin all drive for Kyle Busch Motorsports. Team Owner Kyle Busch shared his advice for Byron as he headed into the first Truck Series Chase. Matt Crafton finished third, Tyler Reddick took home fourth and Timothy Peters rounded out the top-five. Crafton isn’t focusing on the Chase. Cole Custer brought home sixth, Kaz Grala was seventh, Brett Moffitt came in eighth, John Hunter Nemechek was ninth and Johnny Sauter rounded out the top-1o. The Truck Chaser who had the worst day was Daniel Hemric who blew a tire on lap 25 which broke the brake line and put the Brad Keselowski Racing driver 48 laps down in 28th place. Following the race, the truck of John Hunter Nemechek failed post-race inspection for height requirements. Any penalties will probably be announced on Wednesday. The Camping World Truck Series heads to Las Vegas Motor Speedway for the DC Solar 350 Saturday, Oct. 1.